Whatever words apply, a challenge by American Indian tribes on that subject in the latest Nuclear Regulatory Commission report for disposing nuclear waste in Yucca Mountain could slam the brakes on the project. This month, because of a 2013 federal appeals court decision, the commission rejuvenated proceedings on the Department of Energy’s license application to build and operate a repository for the nation’s highly radioactive waste at the mountain, 100 miles northwest of Las Vegas. The project was mothballed in 2010 when the Obama administration decided not to fund it and instead pursue another path that favors a willing state or tribe to host a repository. Neither Nevada nor the Shoshones want it. The NRC’s draft, 173-page supplemental environmental impact report released in August shows radioactive particles from the planned repository would contaminate groundwater. That means it also would affect purity of traditional American Indian springs in Death Valley, Calif. While that translates to only a “small fraction” increase in the dose people receive from normal background radiation, according to the NRC staff’s report, project opponents say it could be enough to disqualify the site for licensing on grounds of environmental injustice. That’s because burying 77,000 tons of highly radioactive defense wastes and spent fuel from power reactors there coupled with past episodes of fallout from nuclear weapons tests amounts to “environmental racism,” according to the Western Shoshone and Timbisha Shoshone tribes and a Reno lawyer. Western Shoshone Ian Zabarte, a board member of the Native Community Action Council, a party with standing in the NRC’s licensing proceedings, was blunt in his public comments at an NRC panel meeting this month in Las Vegas. “From our perspective the processes employed by the DOE is environmental racism designed to systematically dismantle the living ‘lifeways’ of the Western Shoshone people in relation to our land,” he said. Timbisha Shoshone tribe member, Joe Kennedy of Fish Lake Valley, backed up Zabarte’s claim that the heritage of low-income Native Americans will be compromised if nuclear waste is entombed in Yucca Mountain — a more likely prospect under a Republican-controlled Congress that could try to reverse the Obama administration’s mothballing of the project. DOE has spent roughly 25 years and $15 billion trying to determine whether the site and design are safe for long-term nuclear waste storage. At the Sept. 15 meeting, Kennedy told a story about how his father taught him that all the springs that his tribe relies on for traditional and subsistence purposes are connected. Contaminating the purity of one downstream of the planned Yucca Mountain repository site could pollute all of them, he said. “The Earth can live without us. But I don’t think we can live without the Earth,” he told the NRC panel. Timbisha Shoshone Tribe Chairman George Gholson said the tribe will submit comments on the NRC’s report. 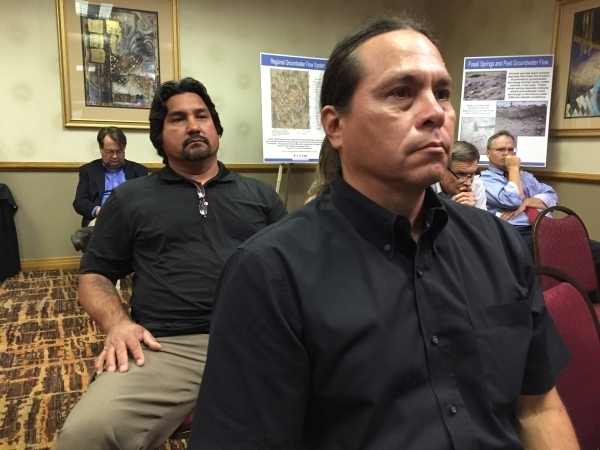 “The tribe vehemently opposes the storage of radioactive waste in our backyard,” he said Thursday. Radioactive particles that will cause that “small fraction” dose increase to humans many years in the future is not background radiation that exists worldwide from natural sources such as cosmic rays and granite formations. In the future, among the most hazardous radioactive particles to human health that will eventually escape Yucca Mountain is neptunium-237 — a mobile, artificially produced alpha particle emitter with a half-life of 2.14 million years, the time it takes for half its atoms to decay. The NRC report, which addresses a required “environmental justice” analysis mandated by a 1994 executive order, says the Shoshones will be no worse off than anybody else. “No disproportionately high and adverse health or environmental impacts would occur to minority or low-income segments of the population” in Death Valley or Amargosa Valley, the commission’s draft report reads. Reno attorney Robert Hager said the federal government made similar claims in a lawsuit he argued for tribes and downwinders when the Defense Threat Reduction Agency announced plans in 2006 to conduct the Divine Strake bunker-buster bomb test with a 700-ton slurry of ammonium nitrate and fuel at the Department of Energy’s Nevada Test Site. After Hager argued that Divine Strake would inject fallout-tainted dust into the air, the agency canceled detonation in 2007. “They lied about the health effects of atmospheric testing. They lied about radiation on the ground when they were going to set off that 700-ton bunker-buster bomb. Now they’re lying about the type of radiation that is going to be dispersed from nuclear waste at Yucca Mountain,” Hager said Wednesday. Richard Miller, an expert witness in the Divine Strake case, said the NRC report’s conclusion on “environmental justice” misses the mark. “It’s a very clever statement that obscures the facts,” said Miller, an industrial hygienist who has written six books on nuclear testing and co-authored three peer-reviewed papers. “The first thing they’re doing is trying to tie particulate exposure with background radiation. They’re apples and oranges, actually apples and toxic oranges. These can wind up inside you, and that’s a (cancer) risk increase,” he said Thursday.